Our Cal Poly recycling stream is "co-mingled," meaning all recyclable materials - cardboard and paper as well as plastic, glass & metal containers - can be mixed together in bins labeled "recycling". The collected recyclable materials are sent to the Cold Canyon Materials Recovery Facility (MRF) for sorting & baling. The MRF is located in San Luis Obispo and accepts recyclables such as glass, aluminum (cans and foil), paper products (i.e. cardboard, pizza boxes, magazines, and office paper), and plastics labeled with numbers 1 through 5 and 7. Plastic # 6, polystyrene (e.g. Styrofoam and red Solo cups) is not recyclable at any SLO county facility. For a more comprehensive list of what is recyclable at Cal Poly and throughout SLO County, visit the Integrated Waste Management Authority (IWMA) website. Campus Dining and Facilities Management and Development partner with Engle and Gray (E&G), a licensed facility in Santa Maria, to compost pre-consumer food scraps from Dining and post-consumer compostable items from large events. About 200 tons of food waste from Campus Dining is composted annually. Food scraps are also collected at student apartments on an opt-in basis to ensure the highest quality & least contamination. Attempts have been made to collect post-consumer compost at food service locations and the campus library, but the resulting materials have been too contaminated to be processed at E&G. On an annual basis, CAFES animal operations produce approximately seven million pounds of manure. Cal Poly Agriculture Operations performs onsite composting of the manure, along with approximately 2,500 cubic yards of green waste generated from campus landscaping maintenance. The resulting 3,500 cubic yards of finished compost is used on the student-run Organic Farm, campus landscaping, and Cal Poly crops for soil amendment, reducing the need for chemical fertilizer. 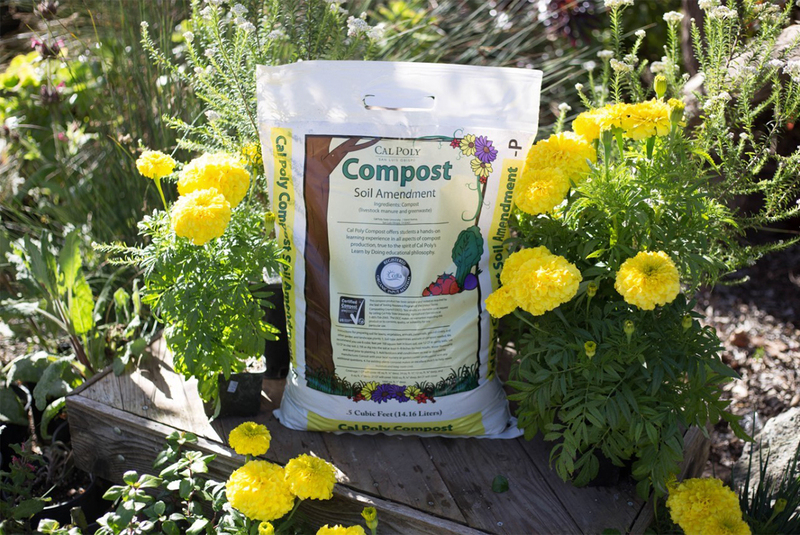 To find out more about Cal Poly Compost or place an order, call Ag Operations at 805-756-2548.